This is one of the most important handouts/resources in our collection. Our speciality has been to take what are often complex topics and issues and try to make them more accessible to all. We believe we’ve managed to explain this life-changing concept in a way that you can better understand yourself and as a result be able to address those issues/patterns/drives that keep you moving in directions that are no longer useful. Traits are the point at which behaviours start to have real influence over us. At this stage, they have become tendencies and propensities, making it much more likely that we will act in the spirit of that behaviour. By the time something has become a tendency it has about 25% influence over our decisions and choices. This is when behaviours start to become a real force. And if that’s moving in a good direction, then that’s great… but when it’s not, we can find ourselves pursuing destructive paths and patterns. At which point the influence of traits grows stronger and a new force is generated… habits! By the time something is infecting and affecting our personality, it has become a habit. Habits are the point in the process when those initial seemingly inconsequential actions have now gained such a momentum that they are forces of nature – literally orchestrating our thoughts, moods, attitudes, perceptions and beliefs. At this point in the process those initial behaviours have at least a 50% influence and control over what we are thinking, feeling and saying. Once again, where this is positive we will find that we are blossoming and growing in amazing ways; when it is not, we continue to be indoctrinated in a manner that is not helpful and paves the way to greater dysfunction. By the time something is part of our character, it is actually dominating our inner world. We are now being ‘driven’ by those beliefs and patterns, whether they are true of false! At this stage most people have built a fortress of beliefs, which they blindly occupy unable to see anything other than what they ‘think’ they know – they remain trapped in their opinions and point of view. This is not worrying if one is caught up in the ‘virtuous cycle’ of kindness, compassion, a sense of humanity and integrity because these virtues support and sustain – they seek co-operation rather than competition. But when one’s fortress is built on hate, blame, criticism and dogmatic beliefs and opinions, a destructive force is afoot. History is littered with so many examples of this; we can also see terrible examples of what a corrupt character is capable of when we look at present day affairs. Character is such a force that if we can harness it in the right way, we can literally achieve anything. Nature is the point at which we are totally consumed by those early behaviours. In fact, they are no longer recognizable as behaviours any more. They appear to be who we are; that’s how we talk of them at this stage – ‘this is me – take it or leave it’. ‘I can’t change, I was born this way’. We’ve often by this point become either proud of the person we are, or terribly ashamed, and yet most of us have not even recognized how we got ‘here’… that is the problem! The tragedy of this position is that we’ve rarely chosen the bricks with which our sense of self has been built. We’ve been cobbled together by the past, our upbringing, our beliefs, many of which we’ve inherited (true or false) and now we’re completely ‘driven’. We’re not driving the self, we’re being forced along a particular pathway. The subconscious mind at this point is essentially running the show. The conscious mind is again and again beaten into submission and unless we question, challenge and also confront these habits that have now become patterns, which in turn have become drivers, we will find we live in the illusion that we are in control of our lives, when we’re simply not. We are being ‘thought’, rather than thinking! When you look at the diagram you will see the arrow goes both ways between behaviour (1) and nature (5). This is because behaviour began this cycle and in the end that’s how our natures are created i.e. what we’ve become. And although behaviours don’t carry the power of their offspring (traits, habits etc. ), they are in fact the primary way to change those things we are most dissatisfied with about ourselves. 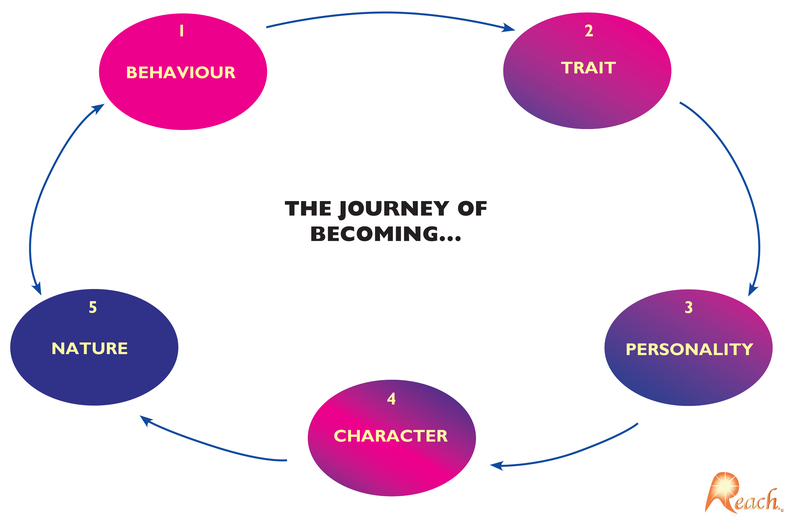 In fact, behaviours hold the key to your transformation. Even that which seems beyond your reach is attainable when you realize that it’s not what you know that counts… it’s what you do! So take this message of hope which shows you how the self is moulded through repetition and time, and anything that you are unhappy with and want to change, you can literally make that so by choosing positive, uplifting activities and making them non-negotiable in your life. You are not a victim of life, so claim your opportunity for positive change today. Also see: Change is a Process not an Event.